Some may say it's overkill, releasing a remastered version of an old classic for the DS and then releasing it for download a few years later. Just how many consoles does the public need Chrono Trigger to be on? All of them, I say! If I had it my way, I would be able to play Chrono Trigger on all major consoles, cellular phones, calculators, toasters, small animals, and large bowls of oatmeal. Today marks just a small step toward my doctrine. 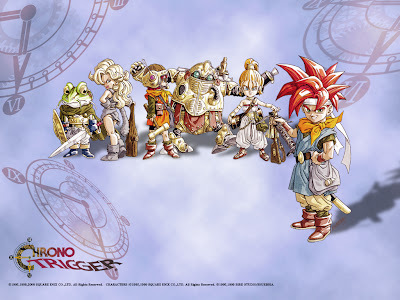 Chrono Trigger is a timeless RPG loved by nearly everyone who grew up watching Teenage Mutant Ninja Turtles (not that rubish TMNT). The classic is being released for a home console once again with its coming to Nintendo's Virtual Console today. It costs a meer 800 Nintendo points, or 8 USD if you want to take away the unnecessary layer of currency abstraction Nintendo places on consumers. It's quite a steal, as the game will most assuredly provide many play throughs for all 15 endings. The game provides many interesting battle techniques, ways to level and cooperate amongst your team, and splendid sidequests to keep gamers interested in the 16-bit charmer for days. I won't keep you here any longer; your time-hopping, dual-teching, end-of-the-world-preventing adventure awaits on the Wii.